A lot of zombie films are quite tongue in cheek. Some are actually quite vicious and harrowing and feature disturbing images without providing relief through comedy. Some attempt to show how truly terrifying it would really be if a rapidly increasing number of the earth’s population suddenly became hell bent on violently killing and eating everybody else. The central conceit remains a little silly but they attempt to distract from this with bloody violence, heavy metaphor and scenes of people having to drive sharp objects into the recently transformed brains of those they love. These films can be easy to identify as they often don’t use the word zombie at all, referring instead to the ‘infected’ and asserting that there is a scientific not a supernatural reason behind what is going on. 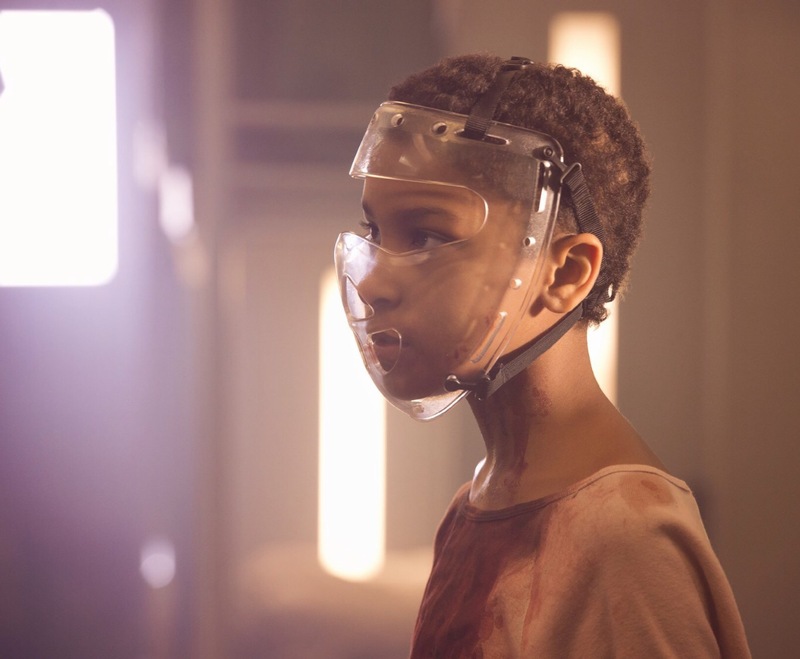 The Girl With All the Gifts is firmly in this latter camp. There are no tongues in cheeks here – muscle, sinew, brains, skin and blood but no tongues. It is a brilliant film though with a gripping story, great performances and high tension. To be sure, The Girl With All the Gifts has much to give, but there are a few things you may not want to receive. The film is regularly unafraid to go to places other movies fear to tread, or aren’t dark enough to propose in the first place. I think the word for it is ‘uncompromising’. 1. So having met the wonderfully polite preteen Melanie at the start and having learnt that the reason she and her classmates are shackled is because they have dangerously antisocial tendencies, the army base where they reside is attacked. Defending her favourite teacher young Melanie leaps on two soldiers and rips their throats out with her teeth. Kids huh? 2. Later on, out of the base and back in the city, Melanie, her teacher, two soldiers and a doctor come across a stumbling crowd of the sleepy infected. One is pushing a pram and the baby in it appears to be moving around under its coverings. Having never seen the post-humans displaying nurturing and caring behaviour before the doc goes over and lifts the blanket, curious to see what state the infant is in. What she (and the audience) sees is that the baby is dead and the movement is a rat nibbling on the expose innards of the hollowed out carcass. 3. As if this wasn’t sufficiently disturbing we are then told the origins of the intelligent child ‘zombies’ of which Melanie is one. They were found in a maternity wing, having clearly been infected in the womb. Surrounding them are the corpses of dead women. It seems that rather than being born in any kind of conventional way these babies, having reached full term, had eaten their way out from inside their mothers. Mercifully you aren’t actually shown any of this. 4. One other thing you do see is Melanie eating a cat. You know sometimes when you bite into a chicken leg and the skin gets stretched as you pull away because you haven’t quite bitten through it? Apparently that can happen when you are eating raw cat too. 5. At one stage a group of feral ‘zombie’ kids eat one of the army guys. As if that’s not bad enough the others find him later, ribs stripped clean and organs well and truly chewed. 6. Then there’s the child who savagely beats another child to death with a baseball bat. There are limits, it seems, as this isn’t one of the heads you see cave in but compared to what had come before this would have been nothing. Perhaps they thought if you’ve seen one mutilated child you’ve seen them all. 7. Have I mentioned the mutant who is chained up and he has got so hungry he is beating his head against some lockers to show what’s inside? (I don’t mean what’s inside the lockers.) Oh, and this has come after he has chewed his own hand off. 8. And right at the end civilisation ends, the carnivorous freaks take over the planet and the one remaining human is kept in a glass box for their entertainment. It’s really impressive but it’s not a feel good film.